The UIAA Medical Commission produces comprehensive recommendation papers, translated into several languages, which act as a valuable resource for climbers and medical staff alike. An emphasis is put on health problems that only occur at high altitude. Among the issues included are acute mountain sickness, nutrition, water disinfection and drug use and misuse in mountaineering. The recommendations are pertinent particularly for charity and gap year treks, expeditions, challenges and adventure holidays. Many are very well run but there are still too many who offer unsafe ascent profiles guaranteeing illness and some who have little or no mountain medicine training for their leaders. Many people who undertake these trips are mountain naïve and do not know how to access medically-based advice. Every year, the UIAA Medical Commission is aware of unnecessary injuries and deaths often as a result of poor leadership and planning. The advice provided in these documents is ultimately designed to help prevent injury and save lives. These general suggestions are designed to guide those who are unfamiliar or less experienced with mountain terrain and who wish to hike or climb. 16 tips for what to do when you are in the mountains, before the tour, during the tour and in case something happens. Harsh environmental factors “especially heat and cold” can significantly affect drugs, the substances as well as stabilisers, solvents etc. Temperatures inside emergency medical bags have been reported to be between -40°C and +80°C. Such temperature extremes may be even harsher in a mountaineering environment. The following recommendations are given on how to handle drugs under such circumstances, side effects and other drug related matters in the mountains. Hiking sticks have become popular among many who walk in the mountains. This document explains the right technique for using telescopic sticks and outlines the advantages and disadvantages of hiking with them. It also explains the correct walking techniques which make the use of sticks unnecessary for healthy hikers. Until recently only mountaineers and high altitude residents were exposed for prolonged periods to a low oxygen (hypoxic) environment. Over the last decade artificial hypoxic rooms have been built as a fire preventative environment for libraries and are now also used for Hypoxic training for athletes and other purposes. The present review examines several neurological conditions and the problems posed by travelling to high altitude, and in particular whether the underlying disease is likely to worsen. The neurological conditions include migraine and other types of headaches, transient ischemia of the brain, occlusive cerebral artery diseases, intracranial hemorrhage and vascular malformations, intracranial space occupying mass, multiple sclerosis, peripheral neuropathies, neuromuscular disorders and epileptic seizures. Climbing often involves travel to foreign and remote destinations, whether for competitions or personal pursuits. Sustaining cuts, abrasions or lacerations, typically on the fingertips in contact with holds, is a common occurrence in climbing. Therefore what is the risk of blood borne infections being transmitted to the climber following – i.e. whether seconding or in a competition? Mountain activity addictive, therefore mountaineers and climbers usually cross the barrier of comfort to achieve goals and to be on the mountain. Going to high altitude can be a risk for those which suffer from cardiovascular diseases because of the low pressure, oxygen and extreme weather conditions. The UIAA Medical Commission has developed a new layperson’s advice sheet on drug use in the mountains. This paper, which you can ready by clicking on the flag below, is the result of five years of discussion and consensus building between experts on the Commission and the international mountain medicine community. Disclaimer: The UIAA is signatory of World Antidoping Code and does not tolerate the use of drugs and methods that are on the Prohibited List among UIAA registered athletes. The UIAA Medical Commission has decided to erase the appendix at No.15 and to include its content in an independent recommendation to address those who are active in helicopter rescue at altitude or who are responsible for the health of the crews. In the early weeks of 2016 media led with stories of the increasing awareness that infection with the Zika virus may be linked to an increase in children being born with birth defects such as microcephaly in some South American countries. The object of this advice article is not only to give the diabetic mountaineer general guidance but also to inform his or her medical team of practical aspects of care that may not be standard for non-mountaineers. The guidelines are produced in seven sections. The paper can be viewed here. This booklet is available here in many languages. Dr Jeremy Windsor and Dr George Rodway, UIAA Medical Commission President, have written four information sheets for popular high altitude mountains. They are for Aconcagua, Denali, Kilimanjaro and Mera Peak. At 6,962m, Aconcagua is the tallest mountain in the Americas. Despite its modest description as a “trekking peak” it is an enormous undertaking. Care needs to be taken if illness and injury are to be avoided. High altitude illnesses such as AMS, HAPE and HACE are seen on a daily basis during the busiest times of the season. Given the weather conditions close to the summit, cold injuries are common too. Each year a small number of deaths occur. Many of these are altitude related and can be avoided. This article describes an ascent that offers an excellent opportunity for a safe and successful climb of Aconcagua. Denali is the highest peak on the North American continent and as such is a highly desired objective for more than a 1,000 aspirants each year. Even in the face of relatively large numbers, mainly on the West Buttress route, the United States National Park Service (NPS) has tried to encourage a philosophy of self-sufficiency amongst mountaineers whenever possible. In this article we’ll discuss a logical and tried approach to an ascent of the West Buttress route, and identify many of the problems you’re likely to encounter along the way. A paper on how to stay safe and healthy when ascending Kilimanjaro. The document can be downloaded here. 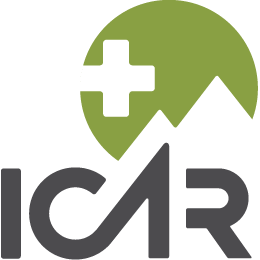 The International Commission for Alpine Rescue ICAR was founded in 1948. ICAR is incorporated as an association under Swiss law, with its seat in Kloten, Switzerland. ICAR does not pursue any commercial purposes and is not profit oriented.